Dear Banks, how’s it going? If you’re reading this, you must be on social media, or you’re at least checking the internet. That’s great. I’ve been meaning to write this letter for a long time. The first thing you should know is that I think you’re really important. Sure, I might like to joke about banker’s hours and bailouts, but the truth is, the alchemical process that turns pay cheques into cash has always inspired me. And I’m not alone. You friendly neighborhood financial institutions are important for just about everyone. Because banking is personal. We let you hold onto our savings, and you give us loans. We eat your lollipops, and you remember our social security number. Public life doesn’t get much more intimate. And that’s exactly what I wanted to talk to you about. Because most of you banks deal with social media — that instantly interconnected mode of communication — as if it were a toxic investment, to be handled carefully and dispensed with as quickly as possible. You’re not wrong. You’re not totally right, either. I didn’t want to have to bring this up, but let’s face it, you’re not getting any younger. And your customers certainly are. Banking has changed dramatically over the last decade, and millennials don’t think about borrowing and exchanging money the same way their parents did. That’s not just because they have less of it. There are new ways of sending, lending and receiving money that are faster and more convenient than ever before, like the new ubiquity of mobile payment systems, micro peer lending via What’s App, and alternative currencies like Bitcoin. These technologies make the classic money transfer look like a Stone Age tool — and if you don’t believe me, just ask Western Union, who’s now developing a new money transfer product exclusively for social media. I haven’t had a chance to talk to them yet, so tell them I said hi. I don’t want to keep rambling on, because time is money, right? The point is, you’re facing competition and you should think of ways to make yourselves stand out. Look, banks, social media doesn’t have to be scary. It’s actually the solution to those nagging problems you’ve been thinking about. You know, making your customers happy and staying relevant in a changing financial climate? You’ve got to be more transparent about what you offer and how you communicate with customers. And that’s exactly what social media is adept at helping brands do. Social media for banks is no longer a novelty or something that’s nice to have. It’s a key differentiator among competition and the best way to appeal to the customers of today and tomorrow. Let me show you what I mean. You remember Santander, right? 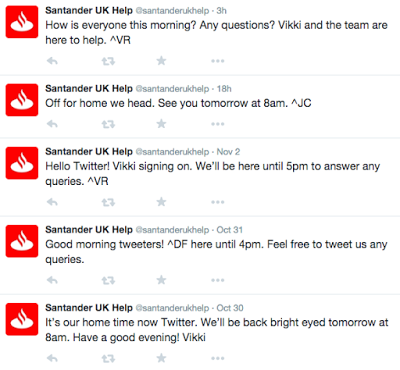 Santander has a separate Twitter account for customer service. It’s pretty cool. Even just having a channel devoted to social customer care shows a digital wherewithal that many of you banks – I hate to say it – lack. But look what else Santander does: each day, the customer care team signs in and out using their real names. Not only does this tell customers when they can expect to get a response, it also immediately establishes a more personal relationship. Not unlike how you might interact with a bank teller. Wait, that’s it! Maybe you’ve been thinking about social media the wrong way. In fact, digital channels are a lot like bank lobbies. People congregate there, some minding their own business, and some gossiping and sharing information. They’re all waiting to talk to your employees, whom they recognise from repeated interactions. And just in case, the employees wear those handy little name tags. So basically, opening a social media account should be like opening a new bank branch. If you build it, the customers will come, and they’ll want fast, responsive, personal service. Sometimes they won’t want to talk, so they’ll head for the ATM. But sometimes they need a real person, not a machine. The way you communicate over social media needs to be human, above all else. I want to show you one more example. Here’s a Facebook post from Santander’s cousin on the other side of the Atlantic. A post like this has a lot going for it. First, there’s the catchy visual. It’s fun and colorful! 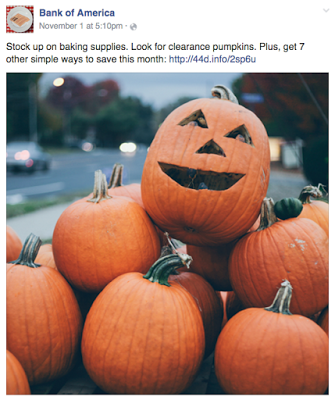 There’s also real-time relevant content, relating to the month of October. Then, there’s the link to more helpful information on the bank’s website. Maintaining an active digital channel like this lets your customers know you’re there, you’re engaged, and you’re ready to communicate. • Your customers expect you to be on social media, so you should be there for them, offering fast, responsive customer service that transparently explains what you do and how you do it. • Don’t be afraid to communicate like a real person! Show the world your sparkling personality. • Your social media posts shouldn’t be all facts and figures. Posting interesting content is a great way to create a sense of community. I wouldn’t tell you this unless I thought you had the potential to be great. You can do it, banks! You just need a little assistance. Think of this as an information loan. Bloomberg has added real time twitter feeds to its Bloomberg Professional service so that market participants can use twitter updates from corporations, executives, governments, media outlets and other sources to help make investment decisions. Customer proposition depends on a data driven approach designed for early adopting, millennial professionals. What is the role of social media in the financial services realm? Banks will be judged on how well they provide mobile services and social media interaction in the coming years. Instead of being just another channel, these forms will be the first point of contact for customers, according to a new report by analyst firm Celent.